Last week, while Americans celebrated Thanksgiving, fires raged across Israel and on social media. While Northern Israel was besieged by “unprecedented” fires, forcing tens of thousands of residents to flee their homes, another battle raged in the war of the Middle Eastern twitterverse. Firefighters fought upwards of 250 large fires, with more than 1500 total fires burning across the region. People across Israel, the Middle East and the world began trading barbs about the fire, both mourning and rejoicing in the devastation. Northern Israel had been extremely dry due to a severe lack of rain. These dry conditions and heavy winds helped readily spread the flames. While the initial fires were naturally occurring, many of the fires that followed are thought to have been acts of arson. As the flames spread, people coalesced on social media around the hashtag #IsraelIsBurning. Throughout the Arab world, the fires were being equated with Israel’s controversial bill to ban outside loudspeakers from places of worship, clearly aimed at preventing mosques from making their 5-time daily Muezzin call. The hashtag, in English and in Arabic, really began to take off when it started getting used by several Imams from Arab Gulf countries, including Kuwaiti preacher Mishary Rashid Alafasy who has 11.6 million Twitter followers. 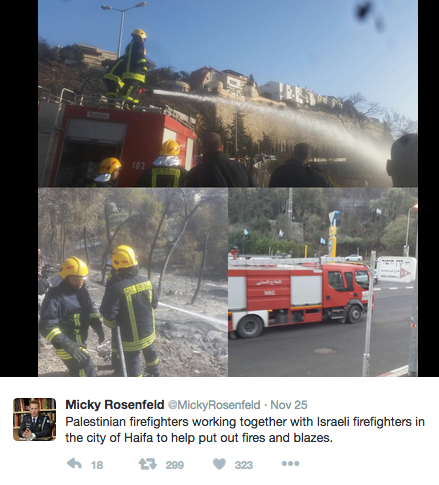 While Israel battled these fires, the world came together to offer assistance. The US, Turkey, Egypt, Ukraine, Greece, Russia and others sent aid, planes, trucks and manpower. 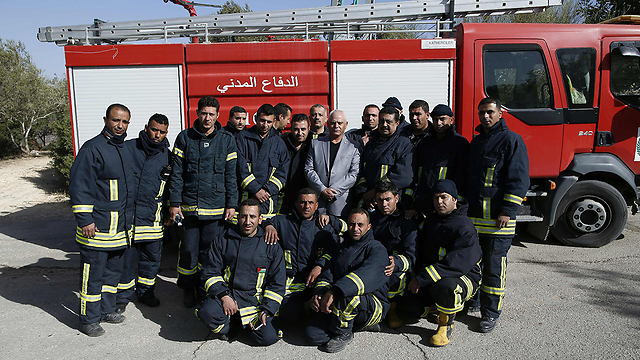 But some assistance came from much closer to home; the Palestinian Authority sent eight firetrucks and four firefighting teams to help battle the flames. 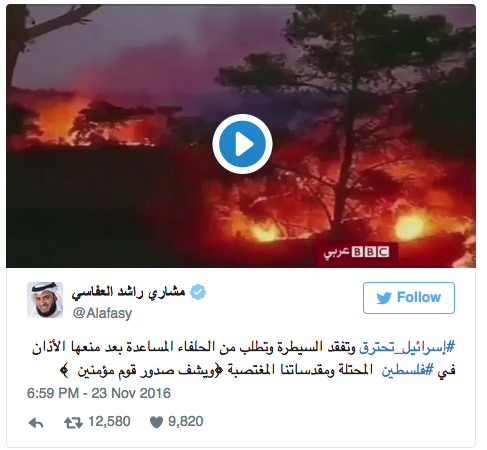 And Israel’s official Twitter account shared a video of Palestinian firefighters at work. 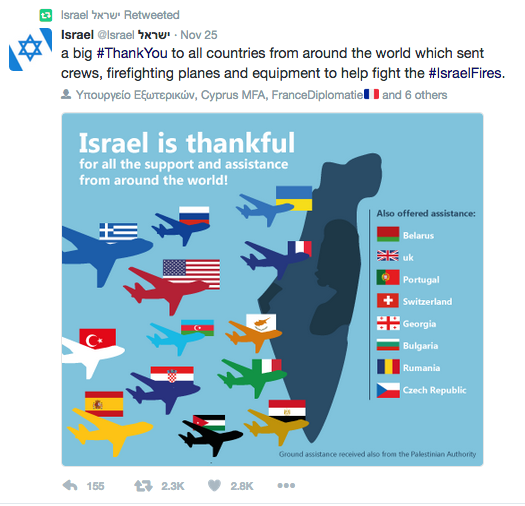 But when Israel made a professional and official graphic stating that “Israel is thankful for all the support and assistance from around the world!” (shared over Thanksgiving weekend), the Palestinians were not included. They received merely a footnote. 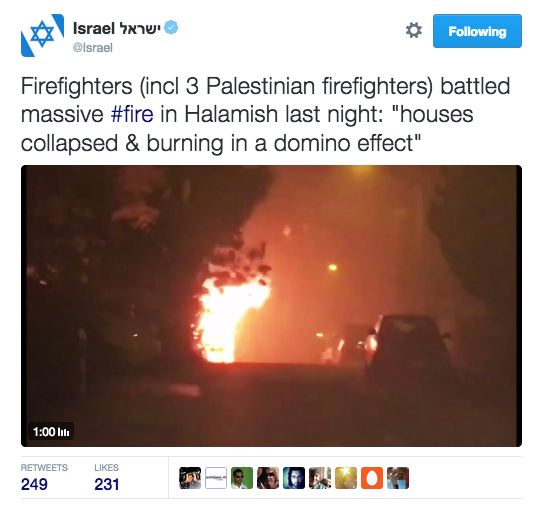 Other than Israel, no one was more directly threatened by these fires than the Palestinians themselves. While Israel was quick to condemn Palestinians lighting the fires as terrorists, they were reluctant to label those fighting the fires as heroes. Belarus, Britain, Bulgaria, Czech Republic, Georgia, Portugal, Romania and Switzerland are all included in the above graphic for simply offering assistance. But while the Palestinians stood alongside Israelis fighting the flames, on social media they were but a footnote. Other related hashtags in use: #Israel_IsBurning, #TelAviv_Is_Burning, #IsraelFires, #IsraelBurns and #IsraelUnderAttack. Follow me on Twitter @jlemonsk. Josh Klemons has an MA in International Peace and Conflict Resolution with a concentration in the Middle East from American University. He has lived, worked and studied in Israel and done extensive traveling throughout the region. He once played music with Hadag Nachash. He now works as a digital storyteller/strategist with brands on finding, honing and telling their stories online. Follow him on twitter @jlemonsk and check him out at www.joshklemons.com.